Here are a few pictures that describe the day I had today in no particular order. 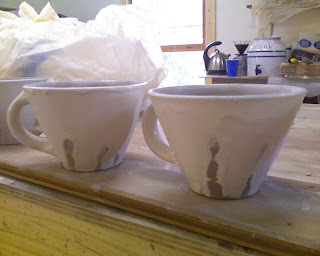 some of the sandy light stoneware I'm using this go around. hay bales. 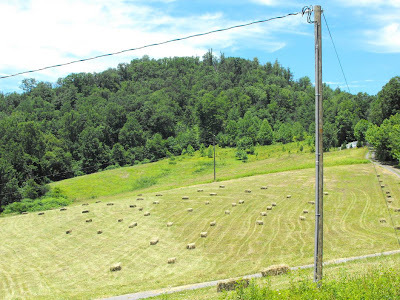 we lease the hay field to our neighbors who take the hay! 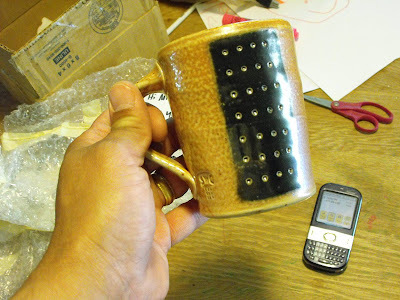 a nice mug I got in the mail from Scott Cooper. We're trading! Destroyer, Deerhunter, and Wolf Parade! I am donating to my high school reunion (thirty years!!) raffle! making a 7 foot haystack, old school style, with the pitchfork. I didn't ramble around Penland as I usually do, instead I took a break from my own pottery action to swing up to peek in on the upper clay class being led by Daniel Johnston. 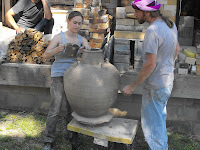 I just happened to get when Kaye Waltman and Daniel were taking a big pot that Kaye had made outside to glaze. 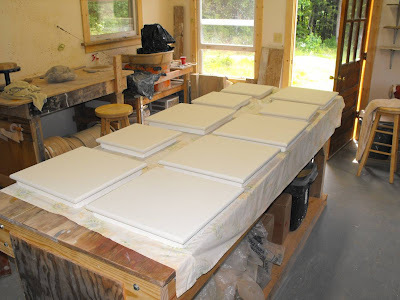 Here is a series of pictures of that process. it's belt removed so that the wheel will spin freely. 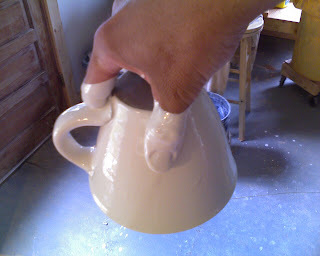 pour and conserve the glaze. One of the curses of being ten minutes from Penland is its strong gravitational pull. Especially when friends and colleagues are teaching up there. 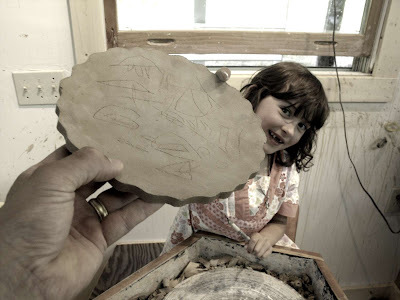 I spent several afternoons up there last session when Ayumi was there teaching, and insisted that I would hit the wheel hard this week and crank some pottery for the upcoming firing (#31). But I found myself drawn into the lights of the pot shop at Penland last night like a big ole Luna moth. And big were the pots, too. 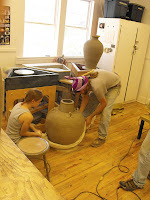 Daniel is showing his coil and throw technique which he employs on his fantasticly big pots in Seagrove, NC. I will swing by a few more times, I'm sure, before the two week session is over. I'll try to bring my tripod next time. After cutting a pot from the wheel, I take in a conscious breath and pick up after I exhale. There is a stillness in between breaths. It helps. 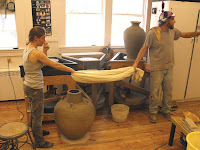 We'll certainly miss Antonia Campanella, who's just finished a two week intership here at the pottery. Toni is the second student from Cleveland Institute of Art that we've hosted. Megan John came here two years ago. Some coincidences: Toni and Megan went to high school together in Chesterland, OH. Home of my good friend Jenny Mendes! I have a feeling we'll be seeing Toni around these parts in the future. We will keep our fingers crossed, anyway. Safe trip home Toni! Toni and I spent the day in and out of the shop, tooling over to Penland for a bagel and then lunch at the coffee house. It's been fun to see Ron over there, having a wonderful time, as far as I can tell. I worked on a couple of ill-fated jars and then decided that we should attack the tool shed with everything we had. Unfortunately, I took that to mean a trip to Lowes (about an hour away) to buy BRACKETS! What was I thinking? Organization , I guess. Well after an entertaining trip to Banner Elk, NC we hauled almost everything out of the 'shed' to start the organizational parade. 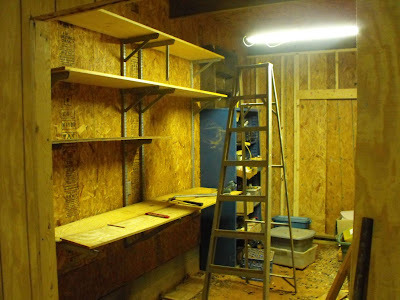 the tool shed and some organization! 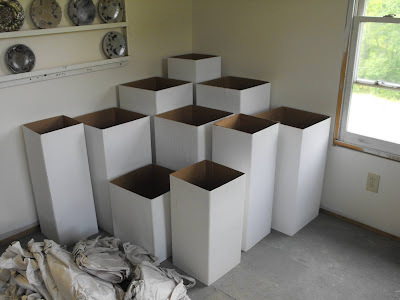 In other studio news, the pedestals are getting a makeover with new paint! I'll be using them at the Craft Fair of the Southern Highlands in a few weeks! They're basically boxes that fold flat when they are in transport, with a MDF board top with styro-foam inserts to give them rigidity. They are light, yet pretty strong for my big pots. The only thing that isn't so good is that they are cardboard and don't take water too well. But since they're just cardboard, their damaged bottom edge can be trimmed in their length without affecting the width of the 'box' and wooden top. These pedestals are from Easy Pedestal out of Rhode Island. and they're still in pretty good shape. new paint on the old pedestal tops. I worked this evening after the girls were put to bed and Stacey came back from her meeting, figuring out how to best use the new brackets! With music cranked on the stereo and hammering and cutting happening, I wondered what the neighbors must think sometimes. I thought of Tom Waits and this song. After a peaceful "blogcation" one must begin somewhere. While away from the keyboard and mouse I have been busy with sales, and blessed by many visitors. Antonia Campanella has been here to lend a hand as my intern from the Cleveland Institute of Art and we've had a great time working together on the Toe River Arts Council Studio Tour last weekend. I've missed sharing all of these times of the past two weeks, only occasionally sending somewhat random pictures from my phone. The space and time during such a blogcation fills quickly and there is much to do (always), and getting back in the game is awkward and a bit like getting in a rapidly spinning revolving door. 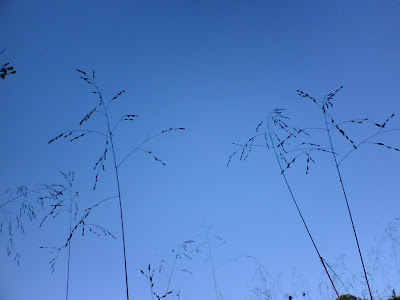 So as an exercise, before dashing into the revolving door of ye olde blogge, I though I would do as most writer's do and just start typing, or in my case hunt and peck. Some things haven't changed, I still have dial-up here at the HQ, as well as the old eMac. I try to fine tune the new workshop and prepare for a new session there, with an ever hopeful spirit that this is going to be the best one yet. 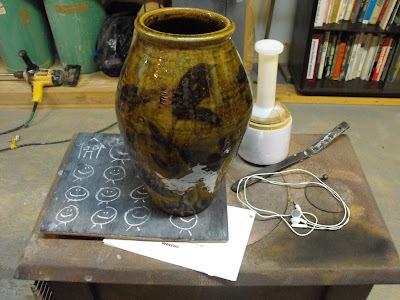 I hope to build on the successes of the last batch of pots, largely gone off into the world, now, and correct the mishaps by triangulating experience, speculation, and blind luck. 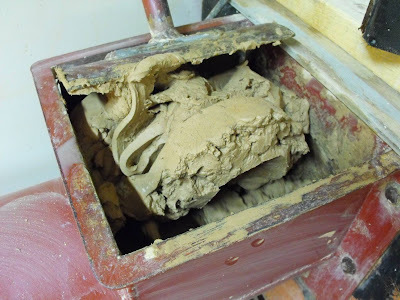 It seems that I've covered most of the topics one can in this blog, but hope to drill down deeper and share what I find in this pottery blog mining with you in the coming weeks. 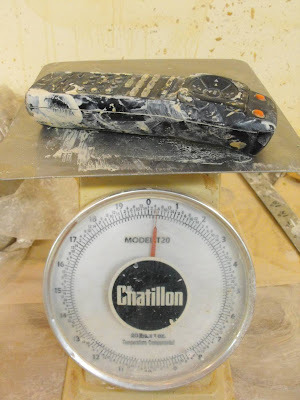 I'm inspired by other potters/artists who take on their keyboard yoke to share their thoughts, opinions, and insights, like Whitney Smith, Ron Philbeck, Scott Cooper, and Catherine White, to name just a few. We had another great day at the TRAC tour! 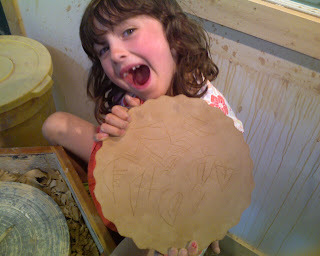 Here's Lillian after carving a picture into a little plate! If you're on your way to the sale this morning, just look for the big blue water tower that marks the entrance to Bulldog Pottery. See you there! 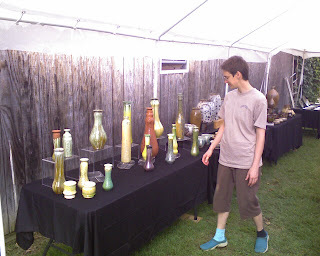 Here is 'cousin' Samantha with a table of beautiful vases. 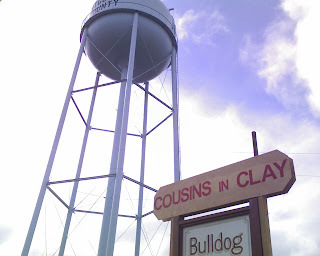 We're almost ready for this weekend's "Cousins In Clay" Pottery Sale. 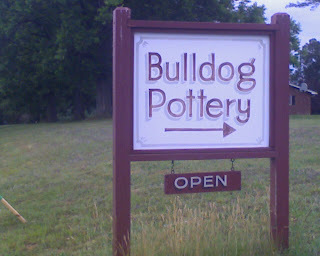 I just arrived at the pottery! More about the sale this weekend tomorrow! 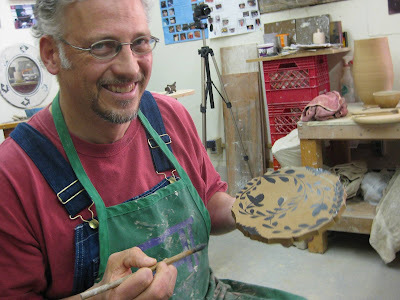 My good friend and most excellent potter, Peter Karner made a visit to the pottery today. 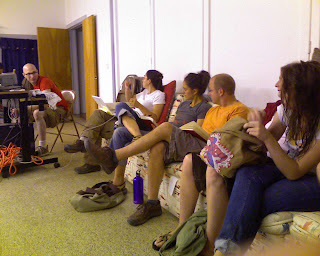 We had a great time catching up with each other's lives and pots and tooled around Bakersville. 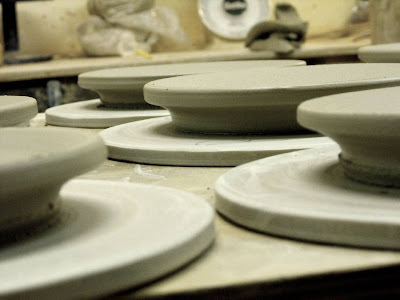 We had special visit with John over at the Crimson Laurel Gallery and saw some sweet pots that have just arrived for the spring. 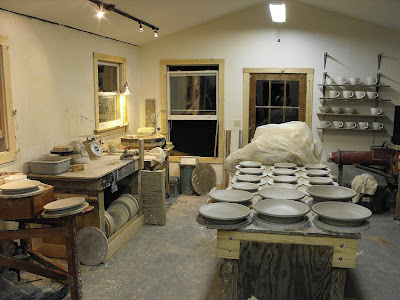 We had a great lunch at Dot's sandwich shop and made our way over to Bandana Pottery where Naomi and Michael have started a new little wood test kiln. 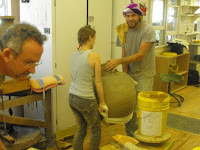 My good friend Maya Maichin is here to help with the kiln building as well as Mike Henshaw, roving potter. We couldn't have picked a more beautiful spring day of leisure! 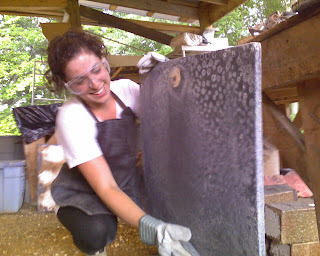 I will be teaching at Snow Farm in about three weeks (June 20-22) and there are a couple of slots still open!!! 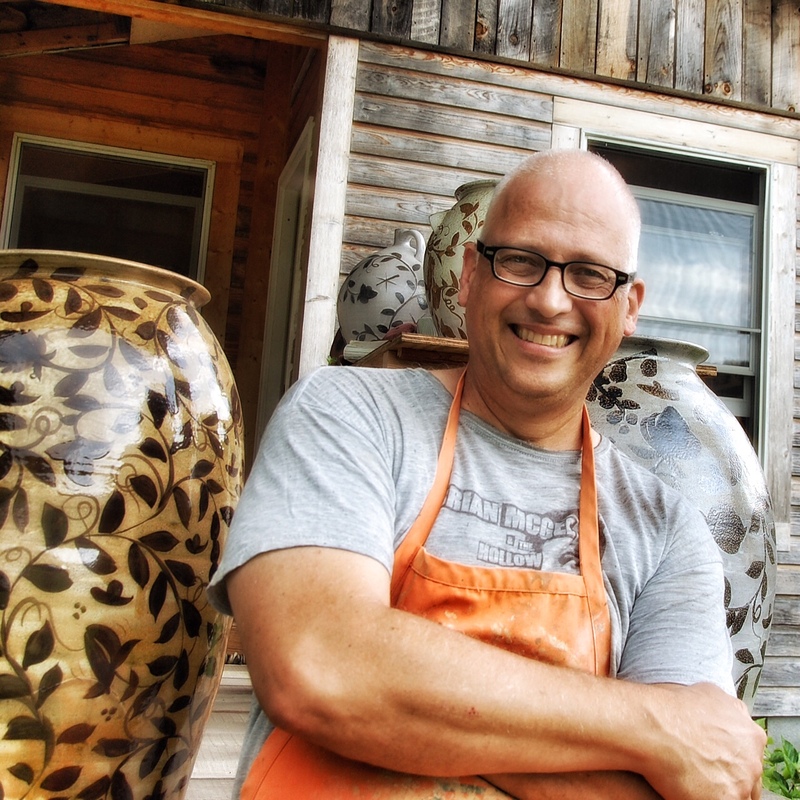 If you're an avid reader/potter and want to spend a few of days working with me in a beautiful New England setting, then why don't you just come on down? 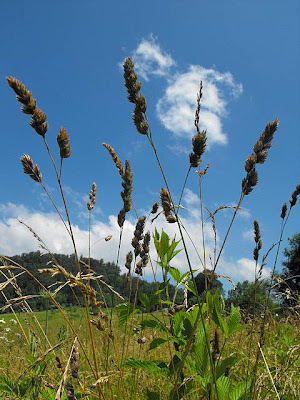 (or come on up, as I will be) I've taught there many times, going as far back to the days when the school was called "Horizons" and I always think of Snow Farm as a cousin of the Penland School and am happy to be going back. 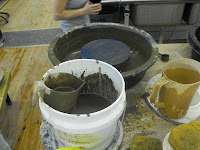 The workshop is "hands on" and we'll make lots of pots and paint pots as well. 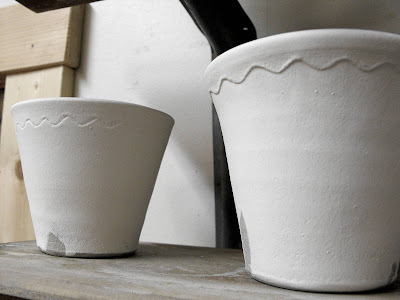 There won't be any time to fire, but we'll certainly talk about how the pots might look in different scenarios and how slips and glazes may affect the finished pieces! I have a bunch of fun brushwork exercises that I've done with groups that help everyone shed any self-consciousness and fear of the blank canvas of pottery and just have fun. 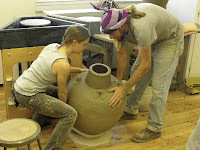 I will demonstrate throwing of a whole range of pots and assist students with their throwing as well. 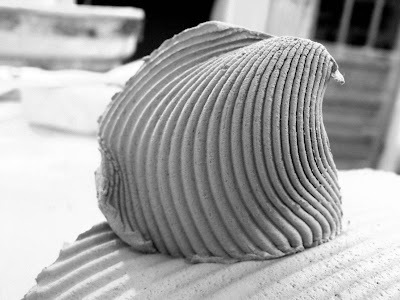 I will talk and demonstrate my various motifs and decorative techniques and help students come up with solutions to their surface design questions. 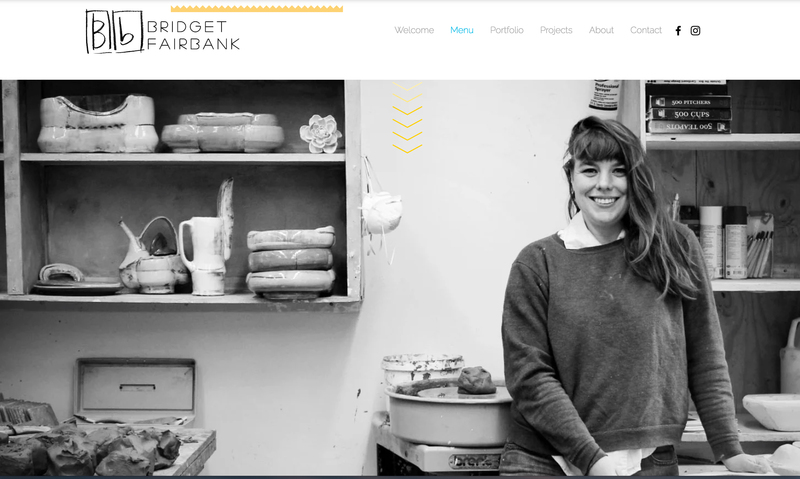 Hopefully there will be time, as we work, to discuss issues related to making pots such as personal voice and vision, marketing and the Internet, and the importance of making and using pots in our daily lives. 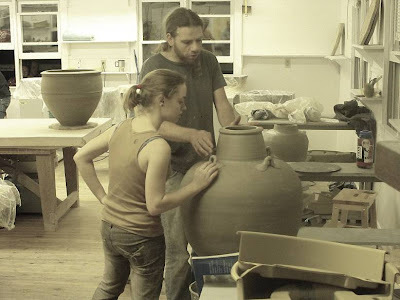 If you're interested in having some pottery fun, improving your brushwork, and making better pots, get in touch with the folks over at the Snow Farm in Williamsburg, MA. for more info and to sign up! I'll let you know when it fills. I hope to see you at Snow Farm!